Upon Ag encounter, naive T cells undergo extensive Ag-driven proliferation and can differentiate into effector cells. Up to 95% of these cells die leaving a small residual population of T cells that provide protective memory. In this study, we investigated the contribution of the BH3-only family protein Bid in the shutdown of T cell responses after acute and persistent infection. Influenza virus pathogenicity has been proposed to be mediated by a peptide encoded in the basic polymerase (PB1-RF2) acting through Bid. In our experiments, we found that after acute infection with influenza virus, mice lacking Bid had normal expansion and contraction of Ag-specific CD8+ T cells. However, in chronic γ-herpesvirus infection, Bid-deficient virus-specific CD8+ T cells expanded normally but failed to contract fully and were maintained at ∼2-fold higher levels. Previously, we have demonstrated that Bim plays a prominent role in T cell shutdown in persistent infection by cooperating with the death receptor Fas, which regulates apoptosis in response to repeated TCR signaling. Bid lies at the nexus of these two signaling pathways, thus we reasoned that Bid and Bim might cooperate in regulation of T cell shutdown in persistent infection. In this study, we observed that the combined loss of Bid and Bim synergistically enhanced the persistence of CD8+ T cells during γ-herpesvirus infection. Thus, these data uncover a role for Bid in coordinating apoptotic signaling pathways to ensure appropriate shutdown of T cell immune responses in the setting of persistent Ag exposure. The mechanisms that underpin regulation of the balance between activation of immune cells to maximize reactivity to foreign Ags while minimizing responses to self are central to our understanding of immunity. Apoptosis plays a critical role in the development of immune cells and in the maintenance of tissue homeostasis. This is achieved through the regulation of apoptotic family members that shape the immune repertoire and terminate immune responses (1). Whether a cell lives or dies is largely due to the interactions between antiapoptotic and proapoptotic members of the B cell lymphoma 2 (Bcl-2) family. The antiapoptotic proteins (Bcl-2, Bcl-XL, Bcl-W, A1, and Mcl-1) share sequence homology in their Bcl-2 homology (BH) domains. The proapoptotic members are divided into two groups: the multidomain proteins (e.g., Bax and Bak) and those that share similarity in the BH3 region (e.g., Bim/Bod, Bid, Bad, Noxa, Hrk/DP5, Bik, Blk/NBk, Puma/Bbc3). This latter group of BH3-only proteins can bind to the prosurvival Bcl-2 family members thereby removing the inhibition of Bax and Bak and inducing apoptosis by permeabilizing the outer mitochondrial membrane (2, 3). In mammals, two pathways of apoptosis, the “Bcl-2–regulated” (also called “intrinsic” or “mitochondrial”) and the “death receptor”-induced (also called “extrinsic”) synergistically regulate the shutdown of CD8+ T cell responses after a chronic immune response (4, 5). The relative contributions of each of these pathways vary depending on the nature of the response—acute versus chronic. In an acute immune response, cessation of lymphocyte recruitment and proliferation is thought to be triggered by a decline in cytokine levels and is mediated (largely) through activation of the BH3-only proteins Bcl-2 interacting mediator of cell death (Bim) and p53 upregulated modulator of apoptosis (Puma) (6–9). Bim and Puma, in contrast to other proapoptotic molecules, bind to all prosurvival Bcl-2–like proteins with high affinity and therefore play particularly prominent roles in the initiation of apoptosis (10, 11). In chronic immune responses elicited by persistent pathogens or tissue self-antigens, the “death receptor” (Fas ligand [FasL]) and the “Bcl-2–regulated” (Bim) pathways collaborate in effecting the removal of Ag-activated CD8+ T cells (12–14). In this setting, the death receptor pathway is thought to be triggered by repeated TCR ligation-mediated induction of FasL, leading to autocrine and/or paracrine Fas stimulation, whereas Bim may be induced in response to a decline in cytokine levels or repeated TCR stimulation-induced calcium flux (5, 15, 16). More recently, Bim, FasL, and BH3-interacting domain death agonist (Bid) have been shown to regulate collaboratively protection against fatal autoimmune hepatitis; however, a similar potential synergistic role in persistent infection has not yet been examined (17). Bid lies at the nexus of the extrinsic and intrinsic pathways: ligation of Fas results in caspase-8–mediated cleavage of Bid to t-Bid and its subsequent translocation to the mitochondria where the intrinsic death pathway is engaged (18). Both acute and persistent pathogens have developed a number of strategies to co-opt components of the apoptotic machinery to impair cell death and to target components of the Bid pathway. Influenza A/PR/8/34 (PR8) virus is of particular interest as it encodes the basic polymerase 1 (basic polymerase 1-reading frame 2; PB1-RF2) (19) that is hypothesized to induce cell death by activating the Bcl-2–regulated apoptotic pathway by sensitizing mitochondria to the proapoptotic effects of t-Bid (20). This mechanism is thought to be critical in defining influenza virus pathogenicity. Previously, we did not detect an effect of loss of Bid on the immune response to acute HSV-1 infection (8); however, it is important to determine whether the specific action of PB1-RF2 in influenza pathogenicity is mediated through Bid in vivo or by an alternate pathway. In addition to the purported action of influenza on Bid, persistent viruses such as herpes and pox viruses express viral FLIPs, which inhibit the activation of caspase-8, the enzyme that cleaves and activates Bid (21). We therefore reasoned that Bid, similar to Bim, might regulate T cell expansion or contraction after acute and persistent infection either in a T cell intrinsic manner or by modulating the survival of APCs. In addition, given the synergistic interactions between Bim and FasL and the importance of Bid in linking these intrinsic and extrinsic pathways particularly in persistent infection, Bid might act with Bim to optimize T cell shutdown. All mice were bred and maintained in specific pathogen-free conditions at the Walter and Eliza Hall Institute of Medical Research. Bid-deficient mice were generated on an inbred C57BL/6 background using C57BL/6-derived embryonic stem cells (22); bim−/− (23) and bim−/−bid−/− (17) have been previously described; transgenic strains Ly5.2 OT-I (Ly5.2.OT-I; H-2Kb–restricted OVA257–264 specific TCR) and Ly5.1 × Ly5.2.F1 bid−/−OT-I. C57BL/6 and Ly5.1 (B6.SJL-PtprcaPep3b/BoyJ) mice were generated and maintained at the Walter and Eliza Hall Institute of Medical Research. Mice were used between 6 and 12 wk of age, and all experiments were performed according to the guidelines of the Walter and Eliza Hall Institute of Medical Research Animal Ethics Committee. Mice were anesthetized with methoxyflurane and then infected intranasally with 3 × 104 PFU recombinant murine γ-herpesvirus-68 expressing ovalbumin (MHV-OVA) (24) or with 104.5 PFU HKx31 (H3N2; X31) influenza virus (25, 26) or 101.39 PFU PR8 influenza virus. CD8+ T cells were enriched from spleen and lymph nodes (LNs) by generating a single-cell suspension and incubating the cells in a mixture of optimally titrated Abs against Mac-1 (M1/70), Mac-3 (F4/80), Ter-119, GR1 (RB6-8C5), MHC class II (M5/114), and CD4 (GK1.5) for 30 min on ice. The Ab-bound cells were removed using anti-rat IgG Ab conjugated magnetic beads (Dynabeads; Dynal). OT-I transgenic cells contained 87–96% TCR Vα2+ CD8+ cells. In vitro-generated effector OT-I CD8+ T cells were labeled with CFSE (5 μM; Molecular Probes) by incubating 107 purified cells per milliliter with 5 μM CFSE for 10 min at 37°C as previously described (27). CFSE-labeled effector OT-I CD8+ T cells (2.5 × 106–5 × 106) were adoptively transferred by tail vein injection in 200 μl PBS into recipient mice. To block nonspecific binding of Abs, cells were incubated in rat IgG (1 mg/ml) together with anti-FcγR mAb (CD16/32, clone 2-4G21) for 10 min on ice. Samples were then stained with fluorochrome-labeled Abs against CD11c (HL3), Vα2 (B20.1), CD8α (53-6.7), CD62L (Mel-14), KLRG1 (2FY), IL-7R (A7R34), Ly5.1 (A20-1.1), and Ly5.2 (104) (all from eBioscience or BD Pharmingen). Virus-specific CD8+ T cells were enumerated by staining with PE-coupled tetrameric H-2b MHC class I complexes loaded with epitopes of MHV-OVA virus (OVA, OVA257–264 SIINFEKL, H-2Kb–restricted; p79 ORF61524–531, TSINFVKI, H-2Kb–restricted; p56 ORF6487–495, AGPHNDMEI, H-2Db–restricted) and influenza virus nucleoprotein (NP; DbNP366–374, H-2Db–restricted) and influenza virus acidic polymerase (PA; DbPA224–233, H-2Db–restricted). Viable cells were analyzed by flow cytometry using propidium iodide (PI) exclusion. To measure Ag-specific cytokine expression, CD8+ T cell-enriched splenocytes were stimulated with 1 μM OVA (OVA257–264) or p79 (p79 ORF61524–531) peptide in presence of Golgi Stop (BD Pharmingen) for 5 h. Cells were then stained for surface molecules CD8α (53-6.7), Ly5.1 (A20-1.1), and Ly5.2 (104), fixed and permeabilized using Cytofix/Cytoperm reagent (BD Biosciences), and then stained for intracellular IFN-γ (anti-XMG 1.2-PE), TNF-α (MP6-XT22), and washed and analyzed by flow cytometry. Mononuclear cells were purified from the lung by generating single-cell suspensions, followed by centrifugation on Histopaque density gradient (1.077 g/ml; Sigma-Aldrich) for 18 min at 2000 rpm at room temperature. Lymphocytes from bronchoalveolar lavage were isolated by washing the lung three times with HEPES-buffered Eagle’s medium supplemented with 2.5% FCS. Dendritic cells (DCs) were purified from the spleen as previously described (28). Effector OT-I T cells were generated by culturing OT-I T cells with OVA-pulsed DCs (1 μg/ml OVA peptide) in complete RPMI 1640 medium (mouse tonicity RPMI 1640 containing 10% FCS, 50 μM 2-mercaptoethanol, 2 mM l-glutamine, 100 U/ml penicillin, and 100 μg/ml streptomycin) supplemented with 30 U/ml human recombinant IL-2. DCs were cultured with T cells at a ratio of 1:10. Cells were placed into fresh medium containing IL-2 after 3 d. On day 7 after initiation of the culture, cells were collected and subjected to a second round of stimulation with OVA peptide-pulsed DCs and then cultured for an additional 3 d prior to adoptive transfer. OVA-specific CTLs were generated in vitro. DCs enriched from the spleens of wild-type (WT) or bid−/− mice were pulsed with 100 ng/ml OVA peptide for 1 h at 37°C. Graded numbers of OT-I CTLs were incubated in 96-well round-bottom plates before the addition of 5 × 104 OVA peptide-pulsed or unpulsed DC targets. After 3-h incubation at 37°C, cells were washed and stained with mAbs against TCRVα2 (B20.1) and CD11c (HL3) and washed before staining with FITC-conjugated annexin V Ab (BD Pharmingen) and analysis by flow cytometry. The percentage of killing was then calculated as follows: [(percentage of annexin+ DCs incubated with T cells − percentage of annexin+ DCs cultured alone)/(percentage of annexin+ DCs cultured alone)] × 100. Influenza infection of APCs is critical to induction of the T cell response. We hypothesized that if Bid is a major mediator of influenza virus pathogenicity (20) through the action of PB1-RF2, it would act through APCs as it does not efficiently infect T cells. Modification of Ag presentation by induction of death of APCs through the action of PB1-RF2 targeting the apoptotic pathway should result in differences in induction of CD8+ T cell responses. To test whether loss of Bid in host cells enhanced CD8+ T cell responses and protection against PB1-RF2–mediated cell death, we inoculated bid−/− and WT mice with one of two strains of influenza A virus, namely X31 or the parent strain, PR8. X31 is a recombinant influenza virus in which the non-coating genes (nucleoprotein NP, acid polymerase PA, basic polymerase PB1, PB2, non-structural NS1, NS2, matrix M1, M2) are derived from the PR8 virus and thus are completely homologous but can differ in pathogenicity. 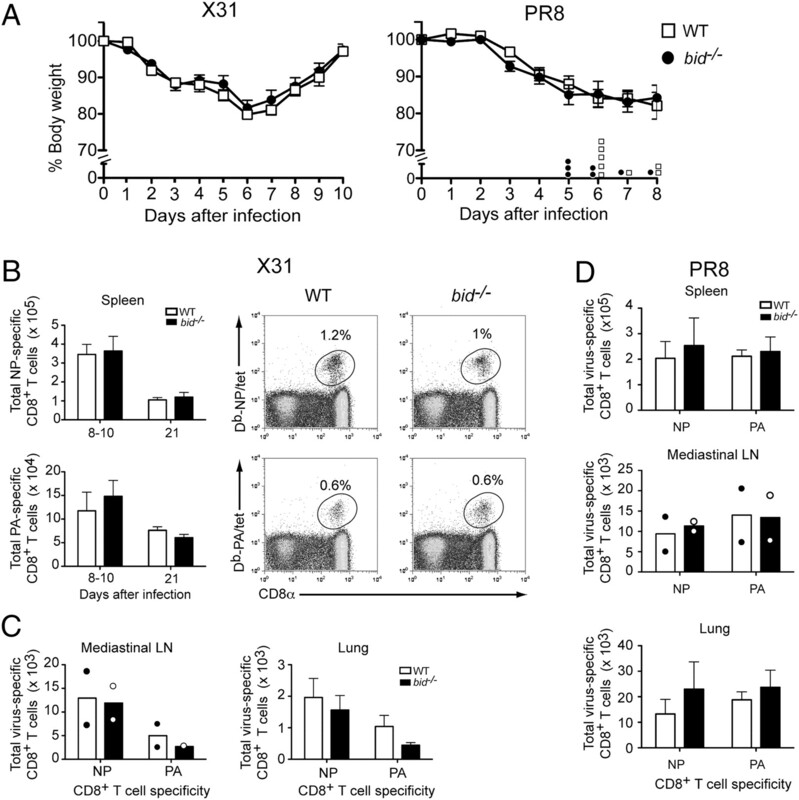 In C57BL/6 mice, intranasal infection with X31 generates a relatively mild respiratory infection compared with that of PR8, and it is speculated that the action of PB1-RF2 may be of greater importance in more highly pathogenic influenza infections. Thus, first we tracked whether loss of Bid enhanced recovery or protection after influenza infection. Primary infection with either of these influenza viruses resulted in similar weight loss in bid−/− and WT mice (Fig. 1A) and no differences in lung histopathology (data not shown). In the more virulent PR8 infection (Fig. 1A, right panel), no statistical differences were observed in the number or timing of death of fatally affected mice. Thus, the loss of Bid did not protect against the more virulent PR8 influenza infection. Bid loss has no impact on CD8+ T cell responses to acute influenza X31 or PR8 viral infection. Bid−/− or WT mice were infected intranasally with X31 (A [left panel], B) or PR8 (A [right panel], D) influenza viruses. A, Body weight of influenza-infected bid−/− (black symbols) or WT (+/+, white symbols) mice was measured daily for up to 10 d postinfection. Data show the percentage initial body weight (mean ± SEM) of 9–12 mice for each genotype. Mice that were killed or that died during PR8 infection are shown as individual symbols. B–D, Enumeration of influenza-specific (DbNP366 and DbPA224) CD8+ T cells within the spleen (B, D), mediastinal LN and lung (C, D) at days 8–10 (expansion phase of response) and 21 d (memory, contraction phase) after primary challenge with influenza virus. Data show the mean ± SEM of the number of virus-specific CD8+ T cells from 6 to 10 mice at each time point pooled from two experiments. For lung, nine individual animals were analyzed, and mediastinal LNs were pooled from four to five mice from each of two experiments; individual values for pooled mediastinal LNs in each experiment are shown as circles. Flow cytometric plots show representative staining of PE-conjugated MHC class I tetramers for DbNP366 or DbPA224 on CD8+ T cell-enriched splenocytes from WT and bid−/− mice 21 d postinfection with X31 (B, right panels). We then analyzed whether Bid influenced the generation or loss of influenza-specific CD8+ T cell responses. The absence of Bid did not result in differences in the number or frequency of DbNP or DbPA-specific CD8+ T cells between bid−/− and WT mice at the peak of the response (day 10) (Fig. 1B, X31; 1D, PR8) or at the time of established immunological memory (day 21) in the spleen, lung, or mediastinal LNs for either infection (Fig. 1B–D). Similar results were obtained in mixed bone marrow chimeric mice in which bid−/− and WT cells exposed to similar Ag loads and cytokine milieu can be analyzed simultaneously for cell intrinsic differences during infection (data not shown). Thus, although PB1-RF2 can exert increased pathogenicity in some infectious settings as highlighted by mutation of this sequence (6, 7, 20, 29–31), it does not appear to do this in vivo through a Bid-dependent pathway in mice as was initially predicted. Next we asked whether Bid plays a role in persistent infection. To identify whether this might be the case, bid−/− or WT mice were infected with recombinant MHV-OVA by intranasal inoculation. This virus generates an acute lytic infection in the lung and mediastinal LNs after which it disseminates to the spleen and establishes persistent reservoirs (32, 33). After 2 wk, the peak of lytic infection, there was no significant alteration in the total cell number, the activation status, or function (Supplemental Fig. 1) of virus-specific CD8+ T cells in the spleens of bid−/− infected mice compared with that in WT mice (Fig. 2). Although loss of Bid at this early stage of infection did not cause any obvious change in lymphocyte numbers or viral titers, we further analyzed the immune response at later stages of MHV-OVA infection (days 72 and 120), when persistent exposure to Ag can drive changes in T cell homeostasis (Fig. 2) (13). The virus-specific CD8+ T cell response to three different epitopes, the surrogate engineered viral epitope KbOVA and two endogenous viral epitopes, Dbp56 (AGPHNDMEI from ORF6487–495) and Kbp79 (TSINFVKI from ORF61524–531), which are associated with lytic and latent gene expression, respectively, were measured. Four months postinfection, bid−/− mice accumulated 2-fold more KbOVA and Dbp56-specific CD8+ T cell populations in the spleen compared with that in WT mice. A consistently expanded population of Kbp79 cells was also observed, although this was not as marked as that for KbOVA and Dbp56-specific CD8+ T cell populations perhaps reflecting differences in overall expression of the different Ags during persistent infection. A similar trend was observed in the lungs and the mediastinal LNs toward the KbOVA and Dbp56 epitopes, although this did not reach statistical significance (Supplemental Fig. 2). In this setting, T cells lacking Bid maintained their functional capacity to produce cytokines such as IFN-γ and TNF-α after short-term in vitro restimulation (Supplemental Fig. 4). This is consistent with our previous observations that T cells exposed to persistent γ-herpesvirus (γ-HV) maintain function (8, 13, 34). Overall, these data suggest that Bid can play a role in the regulation of virus-specific CD8+ T cell homeostasis during persistent infection. Loss of Bid enhances accumulation of virus-specific CD8+ T cell populations in bid−/− mice after persistent γ-HV infection. Bid−/− and WT (+/+) mice were infected intranasally with recombinant MHV-OVA. A, The number of virus-specific CD8+ T cells were enumerated by staining with MHC class I/peptide tetramers. Data show the mean ± SEM of the number of virus-specific CD8+ T cells for 14, 72, and 120 d postinfection pooled from two to three experiments and represent 8–10 mice for each time point. Statistical differences were assessed by a two-tailed Student t test: *p < 0.05, **p < 0.01. B, Flow cytometric plots show representative KbOVA257, Dbp56, and Kbp79 tetramer staining of CD8+ T lymphocyte-enriched splenocytes from WT or bid−/− mice 14 d after infection with MHV-OVA. BH3-only proteins have broad effects on the survival of immune cells. One explanation for the accumulation of bid−/− T cells is that they may be driven to increased proliferation secondary to enhanced survival of DCs in the absence of Bid. To determine whether differences in DC survival may be important, we isolated DCs from naive WT mice and mice deficient in BH3-only proteins Bid and Bim and followed their survival in vitro (Fig. 3A). We did not observe any significant differences in survival between bid−/− and WT DCs, but bim−/− DCs did display a survival advantage (Fig. 3A). This analysis, however, does not exclude the possibility that Bid may play a role in vivo when activated Ag-loaded DCs encounter primed and differentiated effector CD8+ T cells that kill DCs expressing cognate Ags. Indeed, granzyme B released by effector CD8+ T cells can cleave Bid in target cells, thereby activating the Bid-dependent apoptotic pathway (35, 36). Thus, in the absence of Bid activation, DCs may be rendered more resistant to granzyme/perforin-mediated T cell-induced cytolysis. To investigate this, we established a cytofluorometric assay that allows the detection of apoptosis in small numbers of target cells (37). 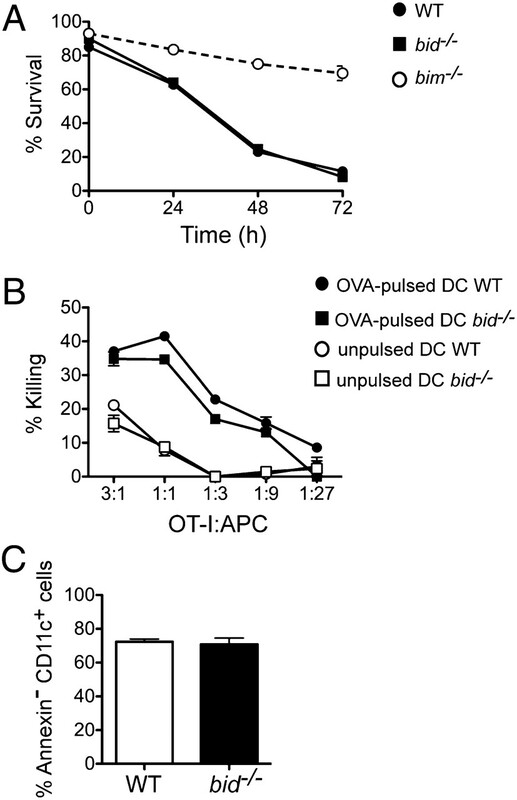 Purified DCs from bid−/− and WT mice pulsed with OVA257–264 peptide were killed with equal efficiency by in vitro-activated OVA-specific CD8+ T cells suggesting that Bid deficiency does not protect DCs from T cell-mediated killing in this setting (Fig. 3B). Furthermore, when DCs isolated from mice 14 d after MHV-OVA infection were examined, they showed equivalent levels of annexin V staining suggesting that infection itself did not alter the potential effects of loss of Bid (Fig. 3C). Thus, collectively these data demonstrate that Bid does not contribute to the death of splenic DCs. Loss of Bid does not affect survival of APCs in vitro. APCs were enriched from spleens of bid−/−, bim−/−, and WT mice by DNase/collagenase digestion and density gradient centrifugation. A, APCs were cultured in complete medium for up to 3 d, and the viability of CD11c+ cells was determined at the indicated time points by staining with anti-CD11c mAb, FITC-conjugated annexin V, and PI. Data show the mean ± SEM percentage of annexin− PI− CD11c+ cells pooled from two independent experiments each performed in triplicate. B, APCs were pulsed for 1 h with 100 ng/ml OVA257–264 peptide or left unpulsed, then cocultured with activated OVA-specific CD8+ T cells at various ratios of APCs/OVA-specific T cell. OVA-specific killing was determined by staining with anti-CD11c, FITC-conjugated annexin V, and PI and analysis by flow cytometry. OVA-specific killing was calculated as follows: [(percentage annexin+ CD11c+ DCs with OVA-specific T cells − percentage annexin+ CD11c+ DCs without T cells) / (percentage annexin+ CD11c+ DCs without T cells)] × 100. Data represent the mean ± SEM of the percentage specific killing at the indicated OT-I/APC ratio. C, Analysis of annexin V staining on DCs isolated from mice 14 d after infection with MHV-OVA. Data show the mean and SEM of four to five mice of each genotype. Given the above findings, it seemed likely that the key effects of Bid deficiency in T cells were intrinsic and mediated by increased resistance to cell death. To analyze specifically the cell intrinsic effects of the loss of Bid on virus-specific CD8+ T cells after the peak of the response, we generated effector CD8+ T cells in vitro by activating OT-I CD8+ T cells using OVA-peptide pulsed DCs. Effector bid−/−OT-I (Ly.5.1/Ly5.2) and WT OT-I CD8+ (Ly5.2) T cells (>95% cells were CD62L−) were labeled with CFSE, mixed in a 1:1 ratio, and adoptively transferred into either naive Ly5.1 mice or mice infected 3 d earlier with MHV-OVA virus (Fig. 4A). This approach allowed parallel tracking of CD8+ T cells that either lacked or retained expression of Bid but that expressed a TCR of equivalent affinity and avidity. Three days after transfer, flow cytometric analysis of the dilution of CFSE showed that both bid−/−OT-I and WT OT-I CD8+ T cells proliferated similarly in the mediastinal LN and lungs of mice (Fig. 4B, top panels). As expected at this early time point (6 d postinfection), proliferation was most prominent in the mediastinal LN (the site of immune activation) while few dividing cells were detected in the spleen of infected mice. However, at 12 d after transfer, at least 5-fold more bid−/− OT-I CD8+ T cells were detected in spleen and 3-fold more in the lungs compared with WT OT-I cells (Fig. 4B [lower panels], 4C; Supplemental Fig. 3). By contrast, there was no difference in the number of bid−/−OT-I CD8+ T cells and WT OT-I CD8+ T cells in the spleens of naive mice over the same time frame indicating that both genotypes survived equally well at steady state (Fig. 4B, 4C). Thus, Bid regulates the death of effector virus-specific CD8+ T when exposed to chronic Ag stimulation. Loss of Bid affects survival but not proliferation of effector CD8+ T cells after stimulation with viral Ag. A, Schematic representation of the experimental approach for adoptive transfer of CD8+ T cells. i.n., intranasal. B, 2.5 × 106 CFSE-labeled naive or effector WT (CD45.2) or bid−/− (CD45.1/2) OT-I CD8+ T cells were adoptively transferred into CD45.1+ naive or MHV-OVA (3 d) recipients. Three days (6 d infection; B [upper panels]) or 12 d (15 d infection; B [lower panels]) after transfer, the mediastinal LN, lung, and spleen were removed and dissociated, and cells were stained with anti-CD8α–allophycocyanin and anti-CD45.1–PE Abs to analyze proliferation of T cells. The percentage of CD45.1/CD45.2 bid−/− or CD45.2 WT TCRVα2+CD8+ OVA-specific T cells recovered from different organs are indicated on dot plots. Histograms show the proliferation of bid−/− (black line) or WT (red) TCRVα2+ OT-I CD8+ T cells. C, Enumeration of bid−/− and WT TCRVα2+CD8+ OT-I T cells in spleen, mediastinal LN, and lung after MHV-OVA infection 12 d after adoptive transfer of transgenic T cells. Data show the mean ± SEM of seven to eight individual mice pooled from two experiments. Mediastinal LNs were analyzed as individuals or pooled from three to four animals/experiments. Individual results are indicated by circles. Statistically significant differences, as assessed by a two-tailed paired Student t test, are indicated: *p < 0.05, **p < 0.01. Although in the absence of Bid more CD8+ T cells accumulate in persistent infection, this failure to shut down the T cell response is more modest than what we have previously shown for Bim (13). However, BH3-only proteins can act synergistically to ensure fine-tuning of the T cell shut-down process. For example, Bim and Fas cooperate to regulate T cell shutdown during persistent infection (13). In addition, Bim, Bid, and Fas work collaboratively in regulating T cell shutdown in hepatitis that may occur under antigenic stimulation (17). As Bid connects the death receptor and the Bcl-2–regulated apoptotic pathways, we asked whether the modest accumulation of bid−/− virus-specific T cells during repeated exposure to Ag was mediated by Bim and Fas dependence on Bid. If Bid operated to optimize CD8+ T cell responses, and thus complement the action of Bim, we hypothesized that concurrent loss of Bid and Bim would result in enhanced survival of T cells over loss of either Bid or Bim alone. Conversely, if Bid does not play a role, loss of both BH3-only family members would not result in any survival advantage to CD8+ T cells compared with loss of Bim. To address this issue, bid−/−, bim−/−, and bim−/−bid−/− double-deficient mice were infected intranasally with MHV-OVA virus, and the virus-specific CD8+ T cell immune response was analyzed 40 d later. Although the number of splenocytes in bim−/−bid−/− mice was significantly higher in bim−/− mice, the number of CD8+ T cells was similar in both strains of mice (data not shown). Despite this, bim−/−bid−/− mice had a 2-fold increase of OVA-specific T cell numbers compared with those of bim−/− mice and was statistically significant (p < 0.05) (Fig. 5A). The number of p79 specific CD8+ T cells was similar in both strains of mice consistent with our earlier findings in bid−/− mice perhaps suggesting the earlier elimination of infected cells by the increased OVA-specific CD8+ T cells (Figs. 2, 5). Phenotypically, virus-specific CD8+ T cells isolated from WT, bid−/−, bim−/−, and bim−/−bid−/− mice were similar, with comparable proportions of short-lived effector cells (KLRG1highIL-7Rlow) and memory precursor cells found in spleen (KLRG1low/intIL-7Rhigh) (Fig. 5B). Collectively, these data show that an unanticipated synergy exists between Bim and Bid in T cells responding to persistent Ag. Bid and Bim cooperate to regulate the accumulation of virus-specific CD8+ T cells during persistent viral infection. A, Bim−/−bid−/−, bim−/−, bid−/−, and WT (+/+) mice were infected intranasally with MHV-OVA and analyzed at 40 d postinfection. The total number of virus-specific CD8+ T cells in spleen was determined by staining with PE-conjugated MHC class I/peptide tetramers loaded with KbOVA257 and Kbp79 (ORF61524) peptides. Data show the mean ± SEM of the number of virus-specific CD8+ T cells pooled from two experiments with seven to nine animals analyzed for each genotype. Statistically significant differences were determined using a two-tailed Student t test: *p < 0.05. B, Expression of activation markers KLRG1 and IL-7R on p79 and OVA-specific CD8+ T cells isolated from spleen 40 d postinfection. Plots are gated on CD8α+PI− cells. Data are representative of two experiments, and plots show the mean ± SEM percentage for each quadrant. In this study, we demonstrated that Bid does not contribute to death of Ag-specific CD8+ T cells during acute influenza infection. This is concordant with our previous observations using acute HSV-1 infection in bid−/− and WT mice (8). Similar to the scenario observed in influenza and HSV-1 infection (8), the induction of γ-HV–specific CD8+ T cells showed a pattern equivalent to that of WT mice. However, when we extended the analysis to examine late time points, over which time Ag is continuously expressed due to persistent infection, we uncovered a role for Bid in preventing the accumulation of virus-specific CD8+ T cells. Loss of Bid resulted in approximately a 2-fold increase in the number of virus-specific CD8+ T cells detected when activated effector CD8+ T cells predominate in persistent infection. To delineate further this phenomenon, activated virus-specific CD8+ T cells were adoptively transferred into infected mice. 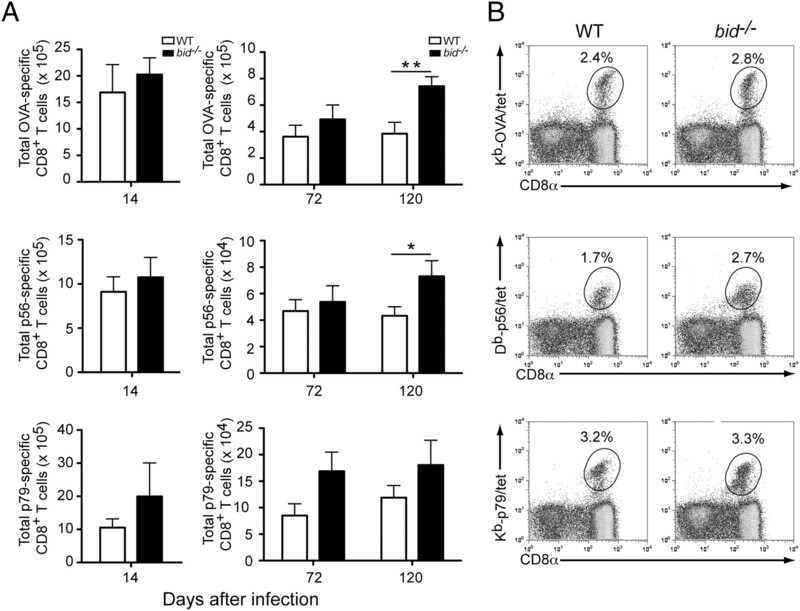 Bid−/− effector T cells accumulated preferentially compared with WT effector CD8+ T cells in response to Ag exposure. Ag appears to be a key factor triggering activation of the Bid-dependent pathway, as after acute viral infections such as influenza or HSV (8), Bid-deficient cells do not gain a survival advantage over WT cells. In persistent γ-HV infection, CD8+ T cell populations that recognized proteins expressed in lytic infection (active viral replication) showed enhanced survival reflecting the role of Bid in regulating survival of effector-type CD8+ T cells exposed to persistent Ag. Intriguingly, in addition to the increased frequency of KLRG1+CD127− T cells typical of a classical effector cell type, we observed a significant population of cells that coexpressed KLRG1 and CD127. The nature of these cells is currently under investigation, but they could represent T cells that have only undergone partial activation and thus not down-modulated CD127 although we find no evidence for functional impairment (IFN-γ and TNF-α secretion) (Supplemental Fig. 1, Supplemental Fig. 4). In vitro repeated activation of virus-specific CD8+ T cells prior to transfer into mice chronically infected with γ-HV mimicked the accumulation of bid−/− cells seen in endogenous T cell populations. Such an effect was not seen when effector CD8+ T cells were adoptively transferred into naive hosts. Although prolonged life span of APCs could perhaps account for such an effect, loss of Bid did not appear to alter survival of splenic DCs. Thus, the contribution of Bid to T cell survival in our studies reflects a T cell intrinsic effect. This cell intrinsic effect of Bid is reinforced by the outcome of adoptively transferred cells into WT infected hosts. It is striking that the phenotype of bid-deficient and bid/bim-deficient mice is less pronounced than that of the bim/fas double knockout mice (Bcl2l11−/−Faslpr/lpr) (13). In this latter study, delineation of the independent intrinsic effects of the compound loss of Bim and Fas on T cells versus APCs was not assessed. Stranges et al. (38) demonstrated that Fas-dependent elimination of APCs is a major mechanism curbing immune responses in chronically activated T cells, particularly in the setting of autoimmunity . As such, prolonged Ag presentation in the absence of both bim and fas is likely to magnify significantly the amplification of T cells responding to infection where systemic loss of these regulators, rather than T cell-specific deletion, has been induced. This may account for the greater difference observed in the bim/fas-deficient mice, where both bim (Fig. 3) and fas (38) contribute to survival of DCs, compared with the bim/bid-deficient mice where only bim appears to impart significantly enhanced survival of DCs (Fig. 3). Thus, it will be intriguing to delineate the precise contributions of T cell and APC intrinsic apoptotic mechanisms to overall control of T cells. Specificity of action of BH3-only family members is exquisitely imparted by differential binding to their partner ligands. Bid can bind with high affinity to most Bcl-2 family members (except Bcl-2) (10) but does not appear to be required for shutdown of T cell responses in acute infections. This is possibly due to the requirement for caspase-8 activation downstream of death receptor signaling for Bid cleavage. Such a situation arises when a pathogen persists in the host long-term and periodically causes immune reactivation. The increased number of virus-specific T cells in bid/bim double knockout mice compared with mice lacking Bim alone suggests that the death receptor apoptotic pathway requires Bid to eliminate virus-specific T cells under some circumstances. Thus, Bid appears not to be essential in the Fas-mediated induced T cell death, but importantly acts to amplify the synergy with Bim and Fas in regulating of T cell death in the setting of persistent infection. In summary, both the intrinsic (Fas-independent) and extrinsic (Fas-dependent) pathways regulate the life and death of lymphocytes. Our results identify that Bid plays an important regulatory role in CD8+ T cell death in vivo during persistent infection. The regulation of T cell death during acute or chronic infections is ultimately determined by the balance between the proapoptotic factors and their prosurvival counterparts. The mitochondrial pathway is regulated by proteins of the Bcl-2 family that dominate during acute infections, whereas the death receptor pathway involves membrane receptors of the TNFR1 family, which play an additional role in chronic infections. In this study, we show that part of this synergy to eliminate lymphocytes in chronic immune responses is mediated through Bid to optimize removal of activated CD8+ T cells. We thank Drs. T. Kaufmann, P. Jost, P. Bouillet, and V.M. Dixit for gifts of bid−/−, bim−/−, and bim−/−bid−/− mice, Dr. F. Battye, V. Lapatis, and C. Tarlinton for expertise with flow cytometry, and M. Camilleri for expert animal care and technical assistance. This work was supported by the National Health and Research Council of Australia (to G.T.B. and A.S.), the Leukemia and Lymphoma Society (to A.S.), the Juvenile Diabetes Research Foundation (to A.S.), a Swiss National Science Foundation fellowship (to F.M. ), a University of Melbourne Research Scholarship (to A.M.), and by a Viertel Fellowship and a Howard Hughes Medical Institute International Fellowship (to G.T.B.). 2005. The role of BH3-only proteins in the immune system. Nat. Rev. Immunol. 5: 189–200. 2005. Apoptotic pathways: ten minutes to dead. Cell 121: 671–674.
. 2003. Mitochondria: releasing power for life and unleashing the machineries of death. Cell 112: 481–490.
. 2000. Apoptosis signaling. Annu. Rev. Biochem. 69: 217–245.
. 2009. CD95, BIM and T cell homeostasis. Nat. Rev. Immunol. 9: 514–519.
. 2003. Shutdown of an acute T cell immune response to viral infection is mediated by the proapoptotic Bcl-2 homology 3-only protein Bim. Proc. Natl. Acad. Sci. USA 100: 14175–14180.
. 2004. Loss of Bim increases T cell production and function in interleukin 7 receptor-deficient mice. J. Exp. Med. 200: 1189–1195.
. 2008. BH3-only protein Puma contributes to death of antigen-specific T cells during shutdown of an immune response to acute viral infection. Proc. Natl. Acad. Sci. USA 105: 3035–3040.
. 2002. 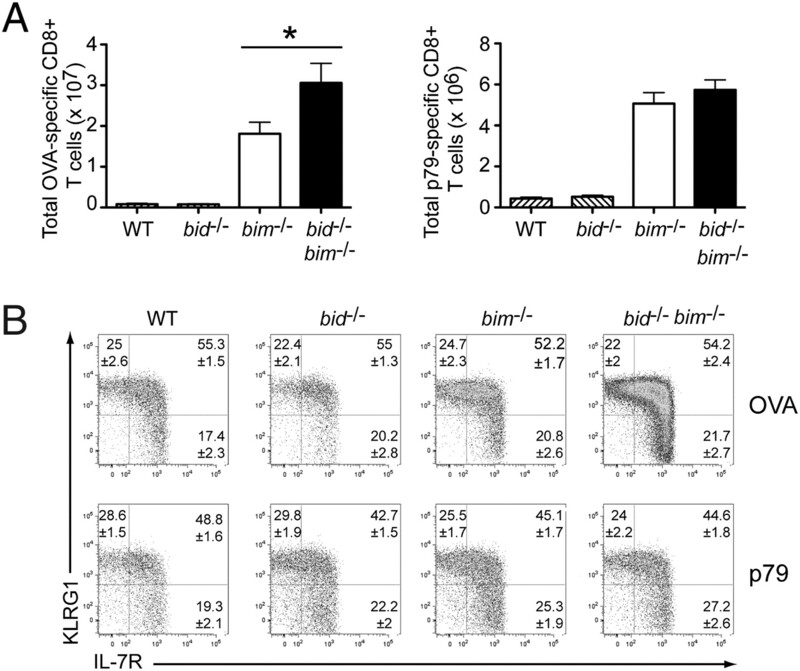 Activated T cell death in vivo mediated by proapoptotic bcl-2 family member bim. Immunity 16: 759–767.
. 2005. Differential targeting of prosurvival Bcl-2 proteins by their BH3-only ligands allows complementary apoptotic function. Mol. Cell 17: 393–403.
. 2005. BH3 domains of BH3-only proteins differentially regulate Bax-mediated mitochondrial membrane permeabilization both directly and indirectly. Mol. Cell 17: 525–535.
. 2008. Apoptosis regulators Bim and Fas function concurrently to control autoimmunity and CD8+ T cell contraction. Immunity 28: 218–230.
. 2008. Apoptosis regulators Fas and Bim cooperate in shutdown of chronic immune responses and prevention of autoimmunity. Immunity 28: 197–205.
. 2008. Combined deficiency of proapoptotic regulators Bim and Fas results in the early onset of systemic autoimmunity. Immunity 28: 206–217.
. 2009. The many roles of FAS receptor signaling in the immune system. Immunity 30: 180–192. 2008. Fas Bim boom! Immunity 28: 141–143.
. 2009. Fatal hepatitis mediated by tumor necrosis factor TNFalpha requires caspase-8 and involves the BH3-only proteins Bid and Bim. Immunity 30: 56–66.
. 1998. Cleavage of BID by caspase 8 mediates the mitochondrial damage in the Fas pathway of apoptosis. Cell 94: 491–501.
. 2001. A novel influenza A virus mitochondrial protein that induces cell death. Nat. Med. 7: 1306–1312.
. 2005. Influenza virus PB1-F2 protein induces cell death through mitochondrial ANT3 and VDAC1. PLoS Pathog. 1: e4.
. 1998. Inhibition of fas death signals by FLIPs. Curr. Opin. Immunol. 10: 552–558.
. 2007. The BH3-only protein bid is dispensable for DNA damage- and replicative stress-induced apoptosis or cell-cycle arrest. Cell 129: 423–433.
. 1999. Proapoptotic Bcl-2 relative Bim required for certain apoptotic responses, leukocyte homeostasis, and to preclude autoimmunity. Science 286: 1735–1738.
. 2007. Dendritic cells present lytic antigens and maintain function throughout persistent gamma-herpesvirus infection. J. Immunol. 179: 7506–7513.
. 1998. Virus-specific CD8+ T cells in primary and secondary influenza pneumonia. Immunity 8: 683–691.
. 2000. A previously unrecognized H-2D(b)-restricted peptide prominent in the primary influenza A virus-specific CD8(+) T-cell response is much less apparent following secondary challenge. J. Virol. 74: 3486–3493.
. 2002. The CD8alpha(+) dendritic cell is responsible for inducing peripheral self-tolerance to tissue-associated antigens. J. Exp. Med. 196: 1099–1104.
. 2001. The dendritic cell populations of mouse lymph nodes. J. Immunol. 167: 741–748.
. 2007. Expression of the 1918 influenza A virus PB1-F2 enhances the pathogenesis of viral and secondary bacterial pneumonia. Cell Host Microbe 2: 240–249.
. 2010. The effects of influenza A virus PB1-F2 protein on polymerase activity are strain specific and do not impact pathogenesis. J. Virol. 84: 558–564.
. 2006. Influenza A virus PB1-F2 protein contributes to viral pathogenesis in mice. J. Virol. 80: 7976–7983.
. 2006. CD4+ T cells specific for a model latency-associated antigen fail to control a gammaherpesvirus in vivo. Eur. J. Immunol. 36: 3186–3197.
. 2009. Immune control of mammalian gamma-herpesviruses: lessons from murid herpesvirus-4. J. Gen. Virol. 90: 2317–2330.
. 2003. Absence of a functional defect in CD8+ T cells during primary murine gammaherpesvirus-68 infection of I-A(b-/-) mice. J. Gen. Virol. 84: 337–341.
. 2000. Initiation of apoptosis by granzyme B requires direct cleavage of bid, but not direct granzyme B-mediated caspase activation. J. Exp. Med. 192: 1403–1414.
. 2005. A central role for Bid in granzyme B-induced apoptosis. J. Biol. Chem. 280: 4476–4482.
. 2002. An improved flow cytometric assay for the determination of cytotoxic T lymphocyte activity. J. Immunol. Methods 259: 159–169.
. 2007. Elimination of antigen-presenting cells and autoreactive T cells by Fas contributes to prevention of autoimmunity. Immunity 26: 629–641.